Add height, dimension, and beauty to your dining room with the charming designs of this buffet and hutch. Behind three glass doors are two shelves, providing a perfect place to showcase your best china or favorite antiques. The buffet features six drawers and two doors, offering ample storage for dining room linens and accessories. With this piece being as functional as it is attractive, this buffet and hutch will make a wonderful contribution to your dining room. The Merlot Buffet and Hutch with Three Glass Doors by Crown Mark at Corner Furniture in the Bronx, Yonkers, Mount Vernon, White Plains, Manhattan, NYC, New York area. Product availability may vary. Contact us for the most current availability on this product. 2147-H-GY Hutch 1 52" 17" 48"
2147-B-GY Buffet 1 52" 17" 32"
Finish Cherry Veneers and Solids in a Merlot Finish. Case Detail Attractive Beveled Edges. With the casual elegance of the Merlot group, create a charming dining room that you and your guests will enjoy for years to come. 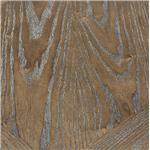 Wood veneers in an attractive smooth finish are beautifully complemented with subtle curves and carved detail. This collection consists of a double pedestal table, buffet, buffet and hutch, side chairs, and arm chairs. The side chairs and arm chairs, however, are upholstered for dining comfort. This dining group has the furniture pieces necessary to enhance your dining room decor. The Merlot collection is a great option if you are looking for Traditional furniture in the Bronx, Yonkers, Mount Vernon, White Plains, Manhattan, NYC, New York area. Browse other items in the Merlot collection from Corner Furniture in the Bronx, Yonkers, Mount Vernon, White Plains, Manhattan, NYC, New York area.